Were you looking for Sangheili Honor Guardsman? The Lights of Sanghelios, sometimes referred to as the Honor Guard Ultras or the "Helios" for short, was a distinctive unit of Sangheili Honor Guardsmen in the Covenant. The name "Lights of Sanghelios" is a reference to a globular cluster of stars near the Sangheili home system. The Lights of Sanghelios represented the most adept and highest-ranking combat units within the Covenant Honor Guard, consisting solely of Sangheili. Members of the elite unit were often given the privileged duty to protect the San'Shyuum of the Covenant. High-ranking San'Shyuum politicians hand-picked Honor Guardsmen within the Lights of Sanghelios to serve as their personal guards for their living quarters. The Ministry of Fortitude's tower was protected by at least two of these Sangheili, who were chosen by the Ministers for their combat abilities. The Lights of Sanghelios were frequently given command of standard Honor Guardsmen in numerous battles and engagements. Despite their stoic nature, Sangheili within this unit would gladly have given their lives to protect a San'Shyuum. On November 2, 2552, following the death of the High Prophet of Regret, the remaining Hierarchs recommissioned the Honor Guard and replaced the Sangheili with the Jiralhanae. The Lights of Sanghelios were likely disbanded as the former Sangheili within the unit handed down their weapons and armor to the Jiralhanae, as they were forced to step down from their position. Shortly after, at the outbreak of the Great Schism, the remaining Sangheili serving within the Lights of Sanghelios attempted to lead Sangheili and standard Honor Guardsmen against the Covenant. The Lights of Sanghelios sported the same ornate armor as the regular Sangheili Honor Guardsmen, with the exception being that the base armor they wear is a distinctive bright-white instead of crimson red. This color is consistent with the Sangheili Ultras of the regular Covenant military, hence their title. 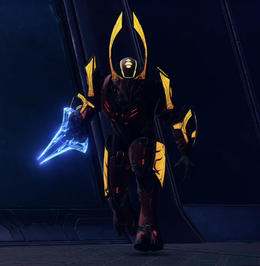 The Sangheili within the unit typically wielded energy staves, though the weapon was mostly ceremonial and was rarely used in actual combat. In most engagements, the Lights of Sanghelios armed themselves with Type-25 plasma rifles or a Type-1 energy sword for close-quarter combat. A Helios handing down his armor to a Jiralhanae during the Changing of the Guard in Halo 2. A guardsman leaving the Hierarchs' chamber. A guardsman without a headdress in Halo 2: Anniversary.